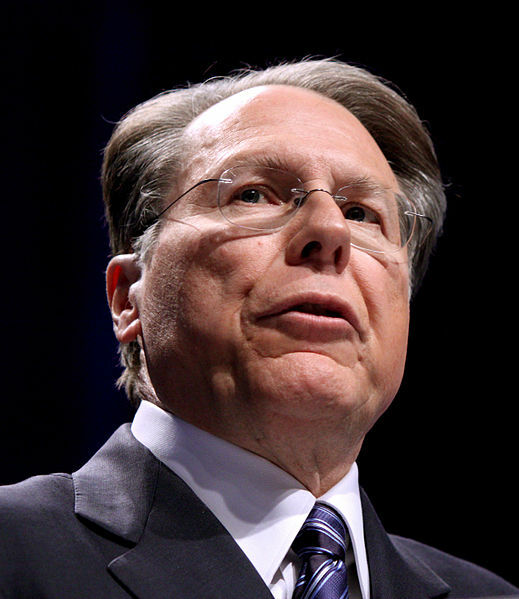 I want to see Wayne LaPierre get up in front of the parents who lost children in the Connecticut massacre and give them a stern lecture on the sanctity of HIS rights. Shopping malls have armed security, why don’t schools and Universities? An armed guard could have stopped this and KNOWING the school had armed security would have deterred the shooter. It’s also worth noting that once again we see the police were of no help at all- they failed completely to prevent even one of the fatalities- so yes indeed, people feel they need to arm themselves. People should get and wear T-shirts and buttons that say: “Guns kill people. Yes they do.” Wear them to the NRA conventions, to the gun shows. Then campaign to get rid of the pro-gun nuts in Congress. It’s a long battle for gun control, but somebody has to start doing it. Ideally, a whole lot of somebodies. The NRA has nothing to due with criminal activity, to state this is purely foolish. If a member of the staff had a concealed weapon the (26) twenty six deaths would be more like (3) three. The same is true for any one of these mass killings within the schools, movies, cafes, etc… With stricter gun control, these numbers would rise and give the criminals confidence that none of the law abiding citizens can fire back. Guns are not allowed in schools presently, maybe that is why these wackos feel safe to attack them. If Jason he thinks that a teacher carry a weapon would have prevented the Newtown killings, he’s as crazy as Adam Lanza. Fortunately, people with Jason’s views represent a tiny, tiny minority of Americans. He is probably on the NRA payroll trolling the Internet to make these outrageous comments. Nobody is addressing the prescription drugs, that are generously given by doctors/pharma companies for every ache, pain, feeling depressed or any other quote “disorder” that is probably a result of MSM programming. These events are too abnormal for a healthy drug free person ! What does it say about American society that so many people feel a need to have guns to defend themselves? And, what does it say of our elected officials in Congress that they gave Netanyahu 29 standing ovations after Operation Cast Lead that killed hundreds of Palestinian children? And, how about the countless children who were shocked and awed to death in Iraq and those yet to die from the cluster bombs and depleted uranium we have scattered in Iraq? While we are keeping score, let’s not forget the estimated half million children who died because of US-inspired and US-maintained sanctions that Madeline Albright thought was worth it. The NRA slogan, “guns don’t kill people, people kill people”…the glaring fact is that “guns, assault rifles and magazines with a extreme number of bullets, facilitate the killing of people…and many of them at a time. I wonder how many NRA members are now looking at their children and grandchildren…I wonder how many in the NRA hierarchy are doing the same. This VERY BIASED article fails miserably. No consideration is taken of the fact that the person(s) who perpetrated mass killings were simply insane. Such article is none than the usual way to take away the right of self-defense, which is an agenda on the part of the american LEFT, commonly known as the Democrats, whom, actually, should be called now COMMUNIST. Part of their agenda is to disarm the people because a population disarmed can be controlled very easily and I can see, from what is happening, that we are getting closer and closer to a dictatorship. I find absolutely fantastic to have seen this Country fight Communism for a long period of time to find a marxist-leninist president sitting in the White House. But one of the causes of what’s happening around us is the complete break-up of the basic principles of a decent society starting from the family. No decency, no respect; everybody speaks of rights but none of duties. And I believe this break-up is a planned one. I believe that those those at the top who hold the economy of this Country in their hands want to reduce us to a population of illiterates who can be controlled.The politicians, starting from the president(s) are just a bunch of patsies in the pocket of big interests. The standards of education have been reduced to a moronic level, the parents are forced to both work and the children are growing by themselves. Certain companies create just types of entertainment detrimental to the minds of our children and there are numerous instances which show clearly the plan. Additionally, the decadence in which the U.S. has fallen has eroded the foundations on which it was built and the Constitution has been WILFULLY reduced to just a piece of toilet paper. If the people do not raise up and return this Country to the principle of the Constitution, the destruction will become total in just a few years. The majority of the US population does not see the above mentioned agenda but when reality will hit in their faces, it will be too late. Although Communists are on the LEFT, not all of the LEFT is communist – a basic distinction which it appears you are not capable of comprehending – for shame, and you an advocate of bettering education! cong dong you beter do your home work Fred Koch was natzi infiltrater and so were the the Bush crime family.. FRED WAS TOLD BY FDR HE COULD NOT LONGER DO BUISNESS, FRED WENT TO RUSSIA AND DID DO OIL BUISNESS THERE. BOTH FRED AND JOHN BIRCH STARTED A SECRET SOCITEY ALONG WITH PRESCOTT BUSH HITLERS SPY AND WAS IN BUISNESS SELLING SECRETS. THE NATZI INFILTRATER FDR AND TYCOO. WERE THE BANKSTERS AND OIL CORS THAT CRASHED THE BANKS AND STATED THE GREAT DEPRESSION. OH BY THE WAY OBAMA IS DEMOCRATE AS BUSHES ARE REPUBLICAINS OBAMA AND BUSH AND CHENEY ARE 9TH COUSINS. GWB 2ND COUSIN TO CHENEY. STOP BULLSHITTING REPUBLICAINS ARE DESTOYING AMERICA WHILE STEALING FOR THE RICH. NRA/ KOCH AND HIS ORG CALLED ALEC ARE INCOHOOTS WITH EAH OTHER! Peter is so right to name the NRA as a major contributor to gun violence in the US. We also need to add that solving problems through violence: murder and war, is as old as civilization. It has been brought to its ultimate modern expression by US triumphalism. Remember how Michael Moore captured this in “Bowling for Columbine”? . Not to mention that we are the only nation to have ever used a nuclear weapon on people. And we did it twice. Are we sure it’s the guns? We’ve had rapid-fire weapons for about 150 years. And while, during that time, some people killed a lot of other people (Billy the Kid was said to have killed 21), mass murder was all but unknown. Outside of war, people killed for reasons, one or two at a time instead of killing a mass of strangers for no reason, for madness. Even the one mass murder we remember from the past, the St Valentine’s Day Massacre, 1929 murder of seven mob associates, wasn’t as mass murder so much as a war between two criminal gangs for money. After WWII, mass murders became more and more frequent. What was different about this time period? Not the guns. During the 20s submachine guns were legal but there was no epidemic of mass murders. What was different was the development of psychoactive drugs, especially antidepressants. A few people have a paradoxical reaction to such drugs, especially SSRI drugs, and instead of their depression knocking them down, the drug allows (or motivates) them to commit mass crimes of violence. People who have taken these drugs have reported such feelings, but the pharmaceutical companies have blocked any study or acknowledgement of this effect. Big Pharma has such power and makes such money from these drugs, (as many as 1 in 10 Americans are said to take them) that they prefer a few mass murders to these drugs being taken off the market. Power. At the very least this link between psychoactive drugs and mass murders needs to be studied, not swept under the rug again. Movies, music, and television, these elites are also the world’s most active promoters of antisocial behavior, including gun-violence.